The Spirit led Simeon (meaning “to hear”) into the temple and he spotted Mary, Joseph and… Jesus! This was no accident but another example of our God’s promise keeping, perfect timing and providential care. God shows Himself faithful and “mighty to save!” Simeon was part of a faithful remnant with that blessed assurance watching and waiting, looking above. Holding and beholding the Christ-child in wilting arms, he is filled with wonder and lost in love! His eyes had seen God’s salvation, so his heart sings the 1st Christian worship chorus. Now, his lips prophetically speak and spread forth this blessed assurance to “the Gentiles and all people”- that’s Simeon’s pure vision for global mission! 1. 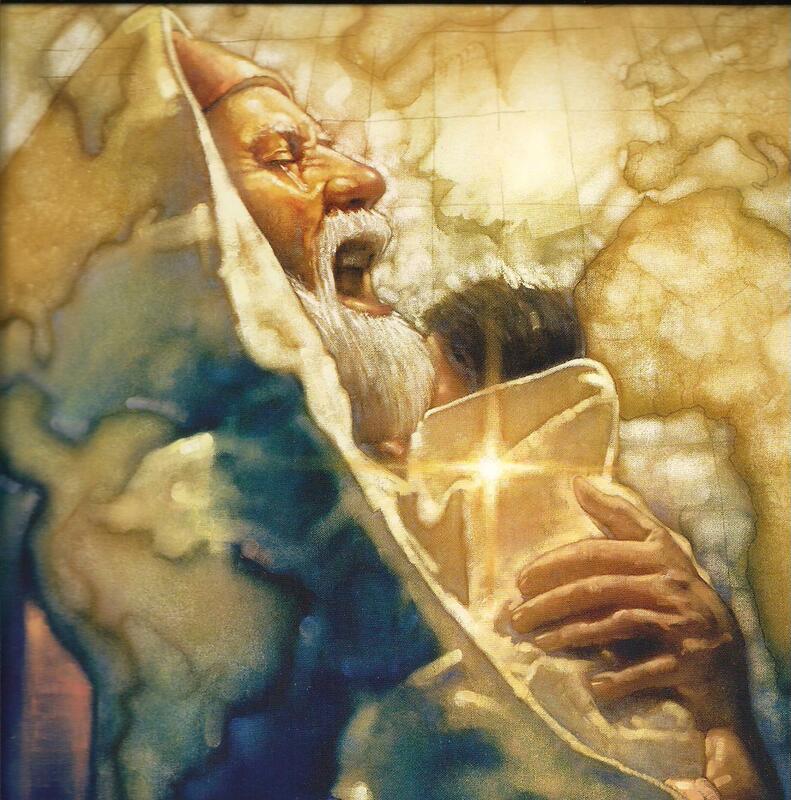 Lord, give us eyes to see you a bit Higher (v.29): Holding this harmless little baby, Simeon sees the Holy One and work of a Sovereign Lord (Acts 4:24; despot) Our On-time God was in control of the how, where and when the Christ was born. He still controls human affairs no matter how bleak our situation seems! This Savior’s arrival meant Simeon’s “departure” – a word used when a ship is loosened to sail away or a prisoner released or tent taken down! Devout and righteous Simeon practiced the presence of Christ: He lived for his coming and now was dying with him and omniscient God watching over his soul! 2. Lord, give us eyes to see you a bit Clearer (v.30): Simeon saw in baby Jesus’ face, the glory of God’s so great a salvation. For hundreds of years, Israel’s learned religious hierarchy had been looking for Messiah. When he eventually arrived, somehow they didn’t care to examine Mary’s child could be or figure him out. Poor Simeon was simply “a man”, no prophet or priest, but he wasn’t “in the dark.” He saw in the Christ-child as the consolation or comfort for Israel God’s discouraged people being oppressed under Rome. His saving message-in-song declared Jesus to be the light of God’s salvation. Jesus was bringing the light into a hopeless world that is lost in the darkness of sin and held captive by Satan! 3. Lord, give us eyes to see you a bit Wider (v.31-32): Israel’s religious leaders with myopic tunnel vision didn’t perceive God’s greater and global purposes in Jesus. Simeon had the eyes of a missionary! Looking at Jesus, he saw what God was going to do “farther” – in regions beyond. Mary and Joseph came to the temple bringing Jesus, who came unto his own, the Jews! Yet Simeon, in all this, saw God’s so loving the world and giving his only Son to be its Savior! He saw God’s promised “Light for the Gentiles” to “all nations.” All such ethnic groups represent those seated and living in darkness! Jesus’ coming to die to forgive sins was light revealing God’s saving grace particularly to the unreached peoples (Isa. 9:1-2; 42:6; 49:6; Acts 13:47). This is the Gospel, glad tidings to all people, in order that all nations will come to know the one, true, living, creator God. Emmanuel: God “in Christ” is dwelling among and with us! 4. Lord, give us eyes to see you a bit Deeper (v.34-35): Simeon took a long, hard look into Mary’s pondering heart to share deeply in its heaviness. Did he know Mary’s boy will soon be scorned as an illegitimate son, lied about by Jewish leaders, betrayed by his friends, sold for a slave’s price by a disciple and condemned to die as a criminal?! What we do know, as predicted (Isa 53) Jesus was be despised and Simeon understood the hard hearts of all who reject God’s Son as Savior. His empathetic eyes had insight, foresight and vision concerning Mary’s “sword-pierced heart”. He sensed what one day she would watching this child she brought forth and the Son God sent forth, die on the cross! At last Simeon’s long wait was over! He is honored to hold in his hands an infant yet the infinite One by whose hands the worlds were made! The Father had sent his Son to be our Savior! Jesus is that way and truth that leads to Life (Jn. 8:12). No one comes to God but by him! Till he fully restores Israel’s glory, Jesus radiates God’s life so you and I can be saved. Oh, How deep the father’s love for us; how vast beyond all measure! Have you looked unto Jesus? Look and Live! Thanks Chris for reminding of God’s ways of giving insights to ‘commoners’ ,young and old,to see visions and speak it out in clarity!